Online Communities: Do they help you to manage diabetes? 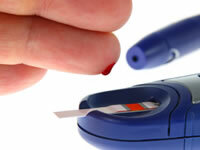 Blood glucose testing is one part of managing your diabetes successfully. Testing your blood glucose both before and after a meal allows you to see how that meal affects your blood glucose levels and helps you to understand which meals may be best for your blood glucose control. The most powerful influence on blood glucose levels comes from food. Whether you have type 1 or type 2 diabetes, the peak blood glucose levels are often likely to occur around two hours after meals. What is pre and post meal blood glucose testing? Pre and post meal testing allows you to see how your meal and, where relevant, your medication for that meal affects your blood glucose levels. Post-prandial blood glucose measurements are commonly taken two hours after you have eaten. Pre-prandial and post-prandial means the same thing as before meal and after meal testing. Why is pre and post-prandial testing useful? If you test only before meals or only after meals, you don’t get to see how your levels are actually being affected by the meal itself. The advantage of testing in so called ‘pairs’ of before and after meal tests is that you can see how much your sugar levels have gone up (or even down) between meals. If your blood glucose levels tend to rise to high numbers after meals, it can leave you feeling tired and also could increase your likelihood of developing complications so there’s very good reasons behind testing before and after meals. Some people may be put off by seeing high after meal readings but this can represent a chance to re-evaluate your diet or meal choices or to discuss your regime with your doctor or consultant. What do pre-prandial blood glucose levels show? What the pre-meal test results show may differ slightly for people with type 1 and type 2 diabetes. Type 1 diabetes: Pre-meal tests are a good way of seeing whether you have injected the right size of dose for your previous meal. If it’s a pre-breakfast test, the result will show you whether your insulin to carbohydrate ratio was correct overnight. If you have injected too little insulin, you will see your pre-meal results are higher than they should be before your next meal. If you have injected too much, your test results will be too low before your next meal. If you have questions about insulin dosing, write these down and discuss these with your healthcare team. Type 2 diabetes: Your pre-meal tests can provide an indication of how well your body is coping, with support from any medication, with your previous meal. If you have high results, it may indicate that either the carbohydrate you are eating is too much or that your medication may not be adequate. If you have questions about your results and what they may be showing, ask your healthcare team. What are the recommended pre-meal blood glucose levels? What influences post-prandial blood glucose levels? Your post-prandial blood glucose levels will largely be influenced by the meal you have eaten, the type and dose of medication you take and how sensitive your body is to insulin. Most people with diabetes can expect to see a rise in blood glucose levels for their after meal results. You may want to discuss your personal targets with your healthcare team. What if my test strips are limited? If the number of test strips you can have is limited, it makes making the most out of the test strips you have all the more important. You may not need to test before and after every meal, but any pair results you can take will greatly help your understanding of how the meals are affecting your levels. I have found the best advice for healthy eating is to start with the diabetes web site, then ask your doctor to include you in one of the Desmond courses, which will show you what foods do to you. I've found it's not exactly what, but how much of what you eat or drink. Good advice though. Hi, I have just been diagnosed as pre-diabetic type 2. The nurse at my surgery has given me dietary advice, but told me to include some carbs in my meals (I had been on a healthy eating plan for some months, leaving as many carbs/ starches out of my diet as possible as I am aware that breads etc cause bloating, difficulty losing weight) now I have added them back in I am crashing after lunch, falling asleep, very low etc. I was not told about personal testing (just to go back in 3 months) nor was I given any advice about prescriptions? Am I just expected to guess at what foods are working for me, or allow the surgery to experiment with my diet/ bg etc.... Am I entitled to the same dispensation as a diabetic or what, I feel like I'm in no man's land?! I was having real problems getting my blood levels down but was only being tested periodically by my GP. I complained to him that I was eating all the right things and in moderation but without a testing kit, it was akin to being told to drive for 100s of miles at 32mph without a speedometer. He saw my point and pescribed a testing kit. 12 months later and what a difference - I hit 6.2 (my target) virtually every day. It has also allowed me to eliminate some foods that one would think okay but don't work for me. The moral is, get a testing kit from your GP and don't take no for an answer. I have been type 2 for 1 year now. I have always been fit and underweight all my life and I cannot get a grip of my sugar levels. I am trying to put weight on but I am in a catch 22, I am wasting away. If I eat more my levels increase. If I go to bed having eaten 2 or 3 hours before, I wake up and have a high level reading even though levels were normal on going to bed. I never have low readings unless I do not eat and exercise but then I feel a bit unwell. I see no solution and no help from local GP system. I think I have fallen through the net as they do not ask me to come round for checks anymore. From all the correspondence I see on your web site it is obvious that the medical profession sees Type 2 diabetics as being mainly self inflicted and in these straightened financial times not something that deserves money being spent on as its the patients own fault. (A similar attitude to those who smoke or drink) Fortunately my doctor is more enlightened than those mentioned above and prescribes sufficient test strips to allow reasonable testing. Why is Diabetics UK not issuing firm guidelines on this subject and forcing, through parliamentary lobbying if necessary, that these guidelines be adopted universally by the medical professing instead of money being the guiding criteria. Fortunately I am of the correct BMI, drink virtually no alcohol and do not smoke. Type 2 which I have had for several years now and now being treated by insulin and tablets is hereditary in my family so perhaps he has more sympathy with my situation than those who cause it by obesity and poor diet. I have after 9 yrs of metformin now had 6 months with no medication! Last Ha1bc was 6.7 think next one will be higher as been experimenting with foods. I can now eat virtually anything so long it is calorie controlled with daily exercise, also eating last meal around 7pm helps overall control. Water is essential. Drink 1.5ltrs per day! I am a type 2 diabetes and I test my blood once or twice a week. I haven't seen any changes in my blood levels. Can someone tell me what type of foods are good for blood glucose? I have now asked my doctor twice for test strips. I was told I couldn't have any because the doctors think that Type 2 Diabetes should be managed by visiting the nurse at the surgery for blood tests. SIGN guidelines (the Scots equivalent of NICE) don't make any provision at all for diet controlled diabetics to be enabled to monitor their blood. I have been monitoring, at my own expense, since diagnosis and feel that it has played a big part in helping me be more in control of my diabetes. Given how expensive I will be for the NHS if I don't try and control my diabetes I feel the least they could do is meet me half way by providing strips. A lot of the literature talks about depression hitting diabetics after diagnosis. Although I have days when I'm annoyed about having diabetes (usually when there's a chocolate birhday cake in the environment) for the most part I've been very matter of fact about it. I'm sure that a big part of the reason for this is that I don't feel so out of control because monitoring lets me make sensible decisions about how to change my diet to preserve my health. I am type 2 diabetes and have been for the last three years. I have struggled with keeping my blood sugar levels under control much to the annoyance of my doctor. Metformin didn't agree with me - gave me migraines. Should be using Gliclozide but as i am already 3 stone over my ideal weight it makes no sense in taking a tablet that doesn't help with my weight issues therefore I stopped taking it - I am trying to control again with diet (joined weight watchers) and losing about a pound a week. However, not once has my doctor suggested i test my own levels to see how foods react within my body. When i was first diagnosed I bought my own testing kit, but too chicken to use it or a bit on the thick side, plus the control liquid was out of date. I went to a DESMOND course and they said it wasn't necessary to test when only type 2 diabetes. I just wish they could all sing off the same hymn sheet so it wouldn't be confusing to the ones who are actually going through this and not quite believing the diagnosis. I believe that the stress of a crap job brought out my symptoms and that changed when I left, my symptoms have subsided somewhat but not totally. I feel happy than I have done in years and I am unemployed at the moment. My Doctor is, at the moment, OK with giving me strips. I have dropped my testing to 2 times per day pre-prandial. But I am now switching to 1 pre-prandial in the morning and then a post-prandial test after breakfast and main meal in the evening. I am concerned that although my pre-prandials are OK in reality my body may be fighting high glucose levels after meals and it's high glucose levels at any time that I think I should be controlling? I had fish and chips the other night and decided to test 2 hrs afterwards - I was horrified at how high my glucose was at 11.5 so that's the last fish'n chips from the chippy! I think my doctor has not realised that I am still collecting 50 strips a month as a diet and exercise controlled Type 2. I stay out of the doctors surgery as don't want them to realise!! I started off with Hb1ac of around 7 and now down to 5.5 at the last one 6 months ago. I learnt by testing which foods I could eat. I am on a low carb/low GI diet as this is what suits me best!! I am type 2, using diet and metformin, and I asked my GP if test strips were rationed. He hesitated, then said 'no'. I test 3-4 times a day for 4-5 days in a row, and use the information gleaned from that to moderate what I eat for the rest of the month. 50 test strips last me 2-3 months. I am type 2, I test once or twice a day, first thing in the morning and randomly after meals ( 2 hours after) doing this has enabled me to keep my blood glucose levels between 5.6 - 6.6. I live in Dorset and have not heard of any restriction of test strips. Although I'm Type 2, I have been testing for four years, and it has has enabled me to get my BG down to nearly non-diabetic levels (5.4% HBA1c, down from over 7% at the start). I use the meter to get feedback on what foods keep levels low, and then act on the information - which of course is the essential bit. The first things I learned were that 1)the postprandial peak is usually one hour after meals, not two, and that 2) following the standard dietary advice to eat plenty of starch with meals invariably produces unacceptably high 1 hour peaks and high HbA1cs. Most health professionals who keep up with the research must be aware of that effect - and yet they still push starch at us. Haven't they heard of cognitive dissonance? Although I'm Type 2, I have been testing for four years, and it has has enabled me to get my BG down to nearly non-diabetic levels (5.4% HBA1c, down from over 7% at the start). I use the meter to get feedback on what foods keep levels low, and then act on the information - which of course is the essential bit. The first things I learned were that 1) the postprandial peak is usually one hour after meals, not two, and that 2) following the standard dietary advice to eat plenty of starch with meals invariably produces unacceptably high 1 hour peaks and high HbA1cs. Most health professionals who keep up with the research must be aware of that effect - and yet they still push starch at us. Haven't they heard of cognitive dissonance? I am interested in trial and error at present - used to test before a meal in the am and 2 hours or so after a meal in the evening. I now have a steady (sort of) indication of glucose level at those times so have been just testing pre-meal in the am. Am happy to deal with types of food to keep stable during my day. I received a letter from my GP stating that I was testing too much, i.e .every day at different times. I was told that I had only to test every 3 days as this is the norm as laid down by the East Lancashire Diabetes Network Clinical Standards Group and East Lancashire Drug and Therapeutics Committee which clearly states: if you have type 2 diabetes and you control it with diet, Exercise, Metformin and/or Glitazone you will only need to test your blood 2-3 times a week, if desired and educated to do so. Therefore, 50 blood glucose test strips should last 3-4 months I would be interested to hear if any other member has had the same or other letter on the same lines. There was one report on the disadvantages of monitoring in type 2 and my doctor now refuses to supply me with testing strips. ( This also happened with taking/not taking asprin for Diabetics) When I tested I felt I had good control and wether I was low or high I could take action to regulate. I also found it to be a good indicator of what foods caused swings in readings and if I was "coming" down with something as I read high when ill and this enables me to cope with visiting the doctor and taking steps to reduce the impact of an infection, earlier. I want to be in control of my condition, I do not want this to fall to someone else worried about cost and does not suffer the side affects of the poorly managed care. I used to sit around 7 for my Hba1c test gradually since they have stopped me self testing I am regulary coming back with 9 or 10 scores. Hi I am a newly diagnosed Type 2 diabetic. I am on diet only, but I have been told that as the test strips cost a lot I am issued with many strips. I think this is ridiculous as I am unable to judge if I am going wrong or where I am going wrong. I am Type 2, taking Metformin. I've been told by my diabetic nurse that I only need to test once a week! Your email address will not be published. Your comments may be moderated. By submitting your comments, you agree to the Diabetes Community Rules.